Long-term food storage has always been a problem. How do you get it inexpensively, how do you store it properly and how do you get something tasty so you don't have to eat rice and beans for 5 years if the world economy melts down, if ISIS destroys the power grid or if an EMP changes our lives forever. Augason farms meets all those needs. We have personally sampled everything and the food is tasty, nutritious and filled with the caloric intake you need to survive and take care of your family. Most all products have a 25 year shelf life (some exceptsions) and come in containers that take the hassle and thought process out of having to do it your self. Food deyndrators are great, vaccuum seals are effective and packaging is something that most people can do but where is the time. A very good food dehydrator costs about $3,000 and then the additional supplies to prepare and store are an additional cost. Security AllStar has take all of the labor intensive pieces away and put it at a price that is very affordable. This is your perfect solution for long-term food storage. This premium 1-year 1-person survival food kit is your food-prep solution. 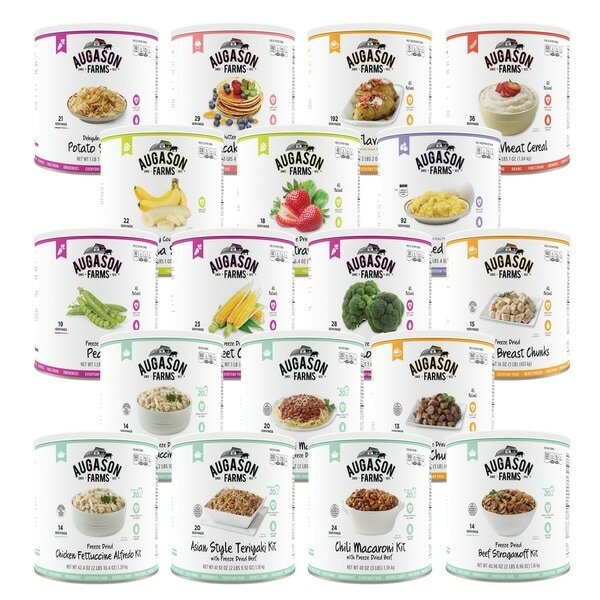 It comes with 12 waterproof pails, each providing plenty of great-tasting, nutritious and easy-to-prepare food for one person every month for a full year. With 307 servings and 54,670 calories per pail, you’ll average over 1,800 calories per day. That’s an impressive number of calories per day considering most emergency food kits on the market provide calories well below 1,000 per day. This 1-year 3-person survival food kit is your food-prep solution. It comes with 36 waterproof pails, each providing plenty of great-tasting, nutritious and easy-to-prepare food for three people every month for a full year. With 10 meal varieties, 307 servings and 54,670 calories per pail, you’ll average over 1,800 calories per day. That’s an impressive number of calories per day considering most emergency food kits on the market provide calories well below 1,000 per day. Our foods are developed with the highest quality and most nutritious ingredients available, so when emergency situations arise, you can rest assured that you and your family will be well fed and well-nourished with food that tastes great. And, you’ll be pleased with how easy the meals are to prepare. Most simply require adding water and simmering on the stove for 15 to 20 minutes. It’s that easy to enjoy a much needed hot meal. 307 servings per pail 10 varieties of meals, snacks and milk Easy to prepare meals, just add water and simmer. Features bestselling entrees and snacks, plus customers’ favorite Morning Moo’s® Milk. Shelf Life up to 30 years*. This 1 Year 4 Person Emergency Food Supply checks off virtually all of the grocery-list items you could need…or want…to have on hand in an emergency. Fruits, vegetables, meats, proteins, wheats, grains, dairy, eggs, breads and baking staples, plus Mexican food, pizza, Italian pasta dishes and an incredible Turkey Feast are just a few of the nutritious and delicious foods you will have at your fingertips in the event of a long term emergency. Who said emergency food storage has to be boring? Personally compiled by Augason Farm’s president, Mark Augason, this kit is his vision of the ultimate survival food supply for a complete year. Your family will enjoy tremendous variation, flavor, convenience and emergency food safety without stepping foot in the grocery store.